Visit Voices of Jordan page at Hurst Co to read the description of the book. 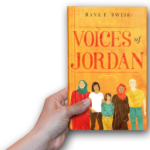 You can now Pre-Order Voices of Jordan on Amazon which will be available in October 2018. “Ordinary citizens are largely absent from the debate in shaping the current and future of the Middle East. By entering the minds, lives and living rooms of ten ordinary people living in Jordan, including a Bedouin, a female parliamentarian, a cartoonist, a Jihadi, and a Syrian refugee, the book gives an insight into everyday lives of these people – their struggles, their dreams and their perspectives on the deeper problems of the region. “Voices of Jordan” will be published later in 2018, illustrated with photos by renowned photographer Salah Malkawi. Ahead of the launch, we spoke to author Rana F. Sweis about the impact of EED support, and more broadly, the change she hopes the book may bring about in the longer term. Stay Tuned for Hurst Catalogue and Pre-Order for Voices of Jordan in April! Happy to announce Voices of Jordan’s book cover and description will be featured in the Hurst catalogue. I will be posting the link to the catalogue where you can also pre-order the book! I am happy to announce that my book will be published by a renowned independent publisher based in London next year. The book will be featured in their catalogue around April 2018 and will be published in September/October 2018. I will be posting updates and links once the book is published next year. Thank you to all who supported me during this journey and I look forward to your feedback. There has been a lot of ‘waiting’ since the completion of the manuscript and photography but I look forward to sharing publishing news soon with you. Meanwhile, I am still visiting and doing follow up interviews with the people featured in the book. You can stay up to date by signing up to the newsletter and you can also find me on Twitter and Facebook. Thank you! Although the journey continues, I’m happy to announce that the manuscript and photography work for Voices of Jordan has been completed. Any updates from now on will be on the publishing process. I am excited to share with you, when I can, the beautiful photos by Salah Malkawi and the different stories featured in the book. One chapter has taken me to Chicago where I write about the life of a Jordanian American. I have also attended several writing workshops and I would like to thank the Voices of Jordan team — translators, transcribers, fact checkers, and everyone else who helped me along this journey so far. Really happy to announce that as I move forward with the remaining chapters of the book, I received some wonderful news from the European Endowment for Democracy. They will be offering their support for this project until the very end. Their support is indicative of their commitment and belief that the stories of the people featured in the book need and should be told. As you know for the past year, I traveled north and south, east and west to see, hear and experience the lives of different people. Every life will tell a story. A story of a country through the eyes and lives of its own people. It continues to be an inspiring journey filled with questions and answers. I visited people in deserts and fields. In some places I saw nothing but gray concrete. Meanwhile, the photography work and writing continues and stay tuned for more updates in the next few months! For the past year, I have been traveling across Jordan conducting dozens of interviews, visiting people in their homes, in their workplace, and neighborhoods. I have also been spending many hours writing, reading transcripts and making sure that both, the voice of the characters and their environment are depicted as accurately as possible. I am happy to announce that I am more than half-way through writing the book. The field work and interviews for six chapters have been completed. For those of you who I meet with or speak to and ask me about the characters and the places or offer advice, thank you. You bring the stories alive. The field work and interviews for six chapters for Voices of Jordan have been completed. I have been incredibly lucky to find some great characters and I look forward to sharing all their stories with you! Looking ahead, I will be working on the final four chapters beginning in March and April. I’m happy to announce that by June 2017, the work for Voices of Jordan will be completed! Still, there’s a lot to do: publishing, printing, marketing. As we enter 2017, I am more convinced than ever that the stories I have heard need to be told, documented, photographed and shared. Interviews and field work for three more chapters! The next phase begins! Three more characters will be identified in the next 10 days and the interviewing and field work will begin right after. Once the next three chapters are completed, more than 50 percent of Voices of Jordan would have been completed. Most of the photographs by Salah Malkawi for the first three chapters have also been completed. Voices of Jordan in New York! I was invited to present and discuss Voices of Jordan in New York. The book talk was hosted by supporter Susan Wicht who focuses on Arabic language and education. The event was attended by teachers, businessmen, patrons, authors, activists and other New Yorkers. I used prezi to present images and main themes and then we opened it up to questions and discussions. Many of the attendees were enthusiastic to learn more about lives of people in the Middle East. Three educational institutions in New York have showed interest in holding book events when the book is published. Meanwhile, the search for a publisher for Voices of Jordan continues. I would like to thank Susan Wicht again for her support and for hosting this event in New York. I would like thank everyone who contributed and supported the crowdfunding campaign for Voices of Jordan seven months ago. I promised each and every one of you that your contribution would go to completing three full chapters and 15 photos. I’m happy to announce that this milestone has been completed and I am looking forward to begin the field work and interviews for the next three chapters. Also the first ‘book talk’ outside of Jordan will be in New York this month. I will be giving a presentation about the cast of 10 characters and how I’m bringing their stories alive. Thank you to Susan Wicht for hosting this event and for her support to Voices of Jordan. Another chapter has been completed! Just a quick update: Another chapter has been completed. I am grateful for the feedback and advice from a few colleagues as I move forward to the next and last chapter funded by the crowdfunding campaign. Thank you to all those who have supported Voices of Jordan so far despite all the challenges. I look forward to completing all the fieldwork and interviews for the next three chapters by the end of the year. Chapter 1 has been completed and I’m hoping to complete the first three chapters of Voices of Jordan by the end of September. We are also conducting research for chapters 4 and 5. We hope to begin the field work and interviews after the completion of the first three chapters. Thank you to everyone who I contacted during this process for their support and feedback. I wanted to also share with you the ins and outs of the preliminary work. Take a look at this Prezi presentation that I prepared for a talk to literature students at the American University of Madaba. Right now, I’m in the writing process and my goal is to complete the first few chapters with the photos in final form soon. Please feel free to subscribe to the latest updates from Voices of Jordan, published work and the website. You’ll receive updates in your mailbox once a month. Through out the process of interviewing, researching and writing, you have to take all the helpful advice you can get. I would like to especially thank Professor Lisa Ohlen Harris for her advice and feedback this month regarding the publishing world and for her support to Voices of Jordan. Lisa is also the author of two books: The Fifth Season: A Daughter-in-Law’s Memoir of Caregiving and Through the Veil (a Middle East memoir). I’m happy to announce that I’ve completed all interviews for the first three chapters and plan on completing the three chapters with accompanied photos by the end of May. Salah Malkawi (the photographer for VOJ) and I visited Wafa Bani Mustafa last week in Jerash and spent the day with her. Wafa is one of the three characters featured in the book. I am grateful for all the time and access that all three characters have provided me while working on this book. Next month we begin hearing from foundations and institutions that we applied to for support. We hope that by the end of May, we will also have a full book proposal and query letter ready to be sent to publishers before we move forward with the rest of the chapters. Thank you for all your support so far. Without you, there would have been no beginning. The first chapter is in progress! I am in the process of researching and interviewing at the moment. I just want to say the interviewing process has been going quite well so far and it’s also been a lot of fun. I still need a few more weeks to feel that I have enough material for the first character. The brilliant photographer who I am working with, Salah Malkawi has already identified the four shots in the book he would like to feature for the first chapter and he is working with the character to finish the photography in the next week to 10 days. I am excited about the Voices of Jordan promo video that is coming out soon!